NEW YORK, June 26 (Reuters) - Major U.S. stock indexes bounced back on Tuesday, but trading was light with the outlook clouded by doubts before yet another summit to tackle the European debt crisis. U.S. stocks partly recovered from losses of more than 1 percent on Monday, led by housing shares after stronger-than-expected data on home prices. The consumer discretionary sector was the top gainer on the S&P 500, followed by energy shares, which were boosted by a 2.3 percent jump in Brent crude prices. Traders remained cautious as Spanish short-term borrowing costs nearly tripled and U.S. consumer confidence fell in June to its lowest level in five months. "Certainly in the United States stocks are nicely priced, and for a long-term investor it is an attractive entry point, but then what about these macro risks hovering around the market? I think it's having a dampening effect," said John De Clue, global market strategist at U.S. Bank's wealth management group in Minneapolis. Spanish 10-year bond yields rose after demand at a shorter-term bill sale fell despite significantly higher yields. Hopes faded that the European Union summit later this week would produce game-changing measures to ease the debt crisis. Madrid has formally asked for funds to bail out its banks in a move some see as a prelude for a full-blown bailout of the euro zone's fourth-largest economy. Rupert Murdoch's News Corp said it was considering splitting into two publicly traded companies, and sources familiar with the matter said publishing would be separated from entertainment. Shares jumped 8.3 percent to $21.76 on volume of 73.1 million shares, making it the day's most actively traded stock on the Nasdaq. The Dow Jones industrial average rose 32.01 points, or 0.26 percent, to 12,534.67. The S&P 500 Index gained 6.27 points, or 0.48 percent, to 1,319.99. The Nasdaq Composite Index gained 17.90 points, or 0.63 percent, to 2,854.06. About 5.9 billion shares changed hands on the New York Stock Exchange, the Nasdaq and NYSE Amex, below the daily average of 6.82 billion so far this year. JPMorgan Chase & Co shares rose 1.1 percent to $35.71 after Goldman Sachs added the bank to its conviction buy list. Morgan Stanley, cut to "neutral" by Goldman, added 0.2 percent to $13.51. The PHLX housing index jumped 2.6 percent after S&P/Case Shiller data showed home prices in 20 U.S. metropolitan areas gained 0.7 percent on a seasonally adjusted basis, topping economists' expectations for a 0.4 percent gain. Facebook shares rose 3.2 percent to $33.10 a day before the underwriters of the online social network's recent IPO are expected to release research on the company. WHEN David Danger went to the MCG on Sunday he was armed with his usual passion for the Melbourne Football Club and a stash of fake cash aimed at lampooning Tom Scully, the young player who had deserted his Demons. He could not have predicted that waving a paper bag full of home-made notes - that he also had pinned to his jacket - almost had him evicted from the stadium and at the centre of a security and civil liberties storm. The MCC and AFL yesterday claimed that MCG officials had tried to remove the Victoria Police employee from the ground after he had used obscene language, but yesterday Danger - seeing himself on television and being widely accused of having a foul mouth - moved to set the record straight. ''At no point did I use an obscenity,'' said the 16-year Melbourne member, who works in the Victoria Police infrastructure and IT department. ''I am not happy with the way I have been portrayed by the AFL spokesman Patrick Keane as well as the MCG spokesman Shane Brown. ''The whole idea that I was swearing seems to be a ruse or cover-up for the fact that I was waving Scully money and wearing a jacket covered in notes, and they actually wanted to quash that. Danger, 38, told The Age he and a friend had prepared the fake bank notes - adorned with photographs of Greater Western Sydney coach Kevin Sheedy, AFL chief Andrew Demetriou and Scully himself - on a photocopier. 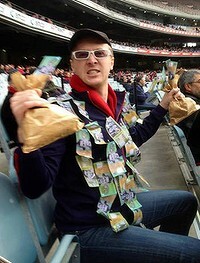 He said his costume and paper money bags drew a laugh from Melbourne player Jack Watts in the warm-up. ''I wanted to have a bit of fun because what he [Scully] did was not the sort of honesty I would have expected of a player. I wasn't surprised when he finally left [Melbourne] but when I heard about his father signing on that was probably the worst part,'' Danger said. He said he was initially reported by an on-ground security official late in the first quarter of the Melbourne-GWS game. He said he had leant over the fence and asked a boundary umpire could he ''offer him one of my bags of Scully money in exchange for a free kick in our forward 50''. Two more security guards approached him and led him to the back of the stand where another five security guards told him he was being evicted for obscene language. Allowed to return to his seat to collect his belongings and watch the remainder of the first term, Danger said it was a victory for people power that he was eventually permitted to see out the game. ''I asked the crowd if anyone heard me swear,'' Danger said. ''Everyone agreed with me. Knowing that they could have a riot on their hands, they [the MCC] decided I was allowed to stay, however I was to remove my jacket which had my Scully money pinned onto it. Three anti-Scully signs were removed from the MCG on Sunday - one because it was too large, one because it obstructed an advertising sign and the third because it was deemed offensive describing the 21-year-old top draft choice as ''Number One Pr---k''. The Dow Jones industrial average rose 32 points to 12,534. The Standard & Poor's 500 index rose 6 points to 1,319, and the Nasdaq composite rose 17 points to 2,854. PulteGroup, Lennar and other housing stocks climbed after a measure of national home prices rose 1.3% in April, the first increase in seven months. (PHM) rose 52 cents to $9.75 and Lennar (LEN) rose 81 cents to $27.39. "There's some good news out there, especially if you look at the housing market," said John De Clue, regional investment director of U.S. Bank's wealth management unit in Minneapolis. "But there's this overriding theme: concerns over global growth. Things are pretty much slowing everywhere you look." Murdoch's News Corp. surged after the media conglomerate confirmed it may split into two companies. The company (NWSA) jumped 8% to $21.84. The split would divide its publishing from its entertainment businesses. The media empire includes The Wall Street Journal, Fox News Channel, and newspapers in Britain and Australia. Nearly two stocks rose for every one that fell on the New York Stock Exchange. Trading volume was thin at 3.3 billion. The economic news in the U.S. was not all good. A morning report showing consumer confidence had fallen in June for the fourth straight month displeased investors, sending stocks initially lower. In Europe, the debt crisis continued to create burdens for countries like Spain, where 28 banks inundated by bad home loans were downgraded by Moody's Investors Service credit rating agency. Concerns over the ability of Europe's leaders to agree on a package of measures to deal with their debt crisis kept global markets in check Tuesday, a day after Cyprus became the fifth euro country to ask for financial assistance from its partners in the currency zone. On Thursday, European Union leaders meet in Brussels for another summit and expectations of a significant change in policy are low even though top European officials, including European Central Bank president Mario Draghi, are touting the benefits of jointly-issued eurobonds, which have been backed by France, Spain and Italy, among others. In a document published Tuesday, they proposed issuing medium-term debt backed by all countries and a banking union with a single authority that would insure banking deposits and have the power to recapitalize banks directly. However, Germany remains reluctant to accept the idea of eurobonds or a banking union as such moves would expose it more to the debt risks of weaker countries. Germany also worries that Europe's indebted countries would have less reason to fix their public finances. On Monday, Germany's Chancellor Angela Merkel indicated that she wasn't planning to change her position. "She did not mince her words and if anyone had previously doubted her resolve to stick to her course then those doubts may well have been removed," said Gary Jenkins, managing director at Swordfish Research. "One would imagine that any optimism amongst officials that this week could see short term measures introduced to help calm the market disappeared with every word Merkel spoke," Jenkins added. The euro was failing to make much headway, trading more or less flat around the $1.25 mark. Also limiting any market recovery was the news that Spain had to pay substantially higher borrowing rates to borrow €3.1 billion ($3.9 billion) after Moody's downgraded 28 of the country's banks. Meanwhile, Cyprus made an official request to tap Europe's bailout fund for money to support its banks. Cyprus did not yet ask for a specific amount, but analysts estimate it will be between €5 billion and €10 billion. "After three days of negative trading, European sentiment is stopping any major rally from happening," said Simon Furlong, a trader at Spreadex. Earlier, Asian markets mostly closed lower amid worries over Europe's debt crisis. Japan's Nikkei 225 index fell 0.8% to close at 8,663.99 while South Korea's Kospi was 0.4% lower at 1,817.81. But Hong Kong's Hang Seng rose 0.5% to 18,981.84. Oil markets were subdued too with benchmark crude down 10 cents to $79.11 in electronic trading on the New York Mercantile Exchange. Most Canadian stocks retreated as the fourth decline in five days by raw-material companies amid concern about the European debt crisis overshadowed gains by financial shares. Gold companies in the Standard & Poor’s/TSX Composite Index plunged 2.4 percent, extending their loss since June 18 to 8 percent. SouthGobi Resources Ltd. (SGQ) tumbled 25.9 percent, the most since 2008. Sun Life Financial Inc. (SLF) and Manulife Financial Corp. (MFC) helped lead the industry’s rally, climbing at least 1.9 percent. In the S&P/TSX (SPTSX), 132 companies declined and 108 advanced. The index advanced 4.03 points, or less than 0.1 percent, to 11,334.42 after losing as much as 0.7 percent earlier. The index has fallen 1.6 percent in June, heading for a fourth straight monthly decline. Concern over the European debt crisis intensified today as Spanish and Italian bonds fell and the euro weakened as borrowing costs increased at debt sales. Canadian stocks fell yesterday, sending the benchmark index to the lowest level since May 18, on concern European leaders may fail to calm the debt crisis during a summit this week. German Chancellor Angela Merkel reiterated her opposition to a shared debt burden in the region. Potash Corp. of Saskatchewan Inc., the largest fertilizer producer, gained 3.1 percent to C$43.53 as corn climbed to the highest level in more than nine months on speculation that hot, dry weather during the next two weeks will reduce yields in the U.S., the world’s largest grower. Barrick Gold Corp. (ABX), the world’s largest producer, fell 4 percent to C$37.83 as gold declined for the first time in three sessions. SouthGobi fell 26 percent to C$4. The company cut output as prices and customer purchases declined and the company awaits a regulatory notification on a plan by Aluminum Corp. of China Ltd. to acquire the Mongolian coal producer. Dismantling code allegedly from the next iPhone 9-to-5 Mac has discovered Near Field Communications embedded in the hardware, paving the way for Apple Commerce come 2013. The code comes from two prototype handsets 9-to-5 Mac reckons are knocking around Cuppertino in the hands of trusted developers and engineers. The rumour site has already revealed a larger screen close enough to 16:9 to show proper video, but now reports that the iPhone being launched by Apple in October will sport electronic payments using the NFC standard. The news isn't shocking, Apple has long been interested in NFC as its patent portfolio shows (Apple has patented all sorts of applications for NFC beyond paying by bonk), not to mention various recruitments in the field, but knowing that it's coming in October will put the pressure on Google to make more of the lead it has with Google Wallet and show that Microsoft's own offering (which comes with Windows Phone 8) is not a moment too soon. Apple's Passbook application, part of the already-announced iOS refresh, is an obvious candidate for NFC integration as it already stores tokens and boarding passes - items which transition to short-range radio very elegantly - but 9-to-5 Mac's information is lacking in the critical detail of whether Apple will be prepared to cede any control to the network operators who have to pay for the iPhones we all use. Google lets the operators play; the current generation of Android handsets support SIM-based wallets through the SWP (Single Wire Protocol) the operators prefer, but those wallets have to exist in competition with Google's own offering. Microsoft, meanwhile, is happy to let the operators own that space and seems to be making no move to try and control the electronic wallet in Windows Phone 8. Apple has, reportedly, been talking to banks about getting their payment cards onto the next iPhone, which would indicate that Cupertino intends to have its own wallet on the phone: so the only question is whether Apple will let the operators put a wallet on the SIM or decide to lock them out entirely as it did with ring tones, downloadable games, and music.